One could be forgiven for thinking that some high-ranking Western sociopaths want to lay the “public opinion” groundwork for another dramatic, live-on-TV, all-out military conflict – a la Iraq – in another instalment of the so-called “War On Terror”. Must be getting boring for them, working behind the scenes with drones, and sponsoring “insurgents” in “popular uprisings” against their leaders in Egypt, Libya, Syria, et al. And of course, the media are always happy to oblige, by reporting whatever cut-n-paste press release comes across their desks from on high. Is the word democracy to be taken from Greek or Latin? The word Democracy comes from Ancient Latin democratis meaning “absolute, total fascist rule” and then backward engineered in the 16th Century CE to appear sourced from Ancient Greek from Latin demos meaning “remove, withhold, take away” and –cratis meaning “right of rule; sticks of even size used to mete corporal punishment; official name of fasces (bundle) of bound sticks and axe representing power of rule under Roman law”. The above statement may be correct. The trouble with a business owned media is that it is not divorced from propaganda to either get its own way (for the benefit of its wealthy owners) or the government for reasons unknown. What we can all depend on is that the media is NOT INDEPENDENT and often acts as a propaganda machine rather than an independent observer. The Gulf War and non existent “weapons of mass destruction” should make this assertion crystal clear to all of us. Why do you qualify it with the Korean debacle? Nothing from the media can be taken at face value, but the trick is determining what is real, what is not and what the agenda is. Justifying a war in the court of public opinion is always considered important by governments in order to get “buy-in” from the citizens. In this case it’s hard to get a feel for the agenda, as North Korea has nuclear weapons. Also, it’s hard to see where this fits in with the misnomered “arab spring” (only if you are a wannabe islamic fundamentalist tyrant could it be called a spring). The arab spring appears to be a lefty version on the war on terror, but North Korea is a more traditional enemy. I suspect that the arab spring is a manifestation of the left’s alliance made in hell with islamists, overturning the traditional opinion that an allied despot is better than islamic fundamentalists. I fear Obama is helping unleash the beast that will not easily be put back in its cage. Going to war with North Korea is a dangerous game, and i don’t the current lot of world leaders are up to a challenge such as this. The Western Banking Military Industrial Oligarchs have shares in all the major media, military,oil,chemical, pharma, banks, and resource Corps.We are the modern serfs.They control our Govts and our money supply. Absolute power corrupts absolutely and the world is on the cusp of total financial collpase leading to WW3. China initially allowed our banks into their country but they still create 80% of their new money via their Govt banks.This is one of the reasons why China can grow at 12% while we are lucky to get 2-3%. In 2008 China was expected to roll over and totally open up,but refused.This is why China was demonised as it strengthened the BRICS alliance and deepened Military ties with Russia and Iran. The real reason the West wants North Korea is to surround China and eventually make them heel to their Western debt based monetary system.Both Paul Keating and Malcom Fraser have warned us about this containment policy of the West who have admitted to their objective of Global Governance via their ” New World Order” on many occasions. 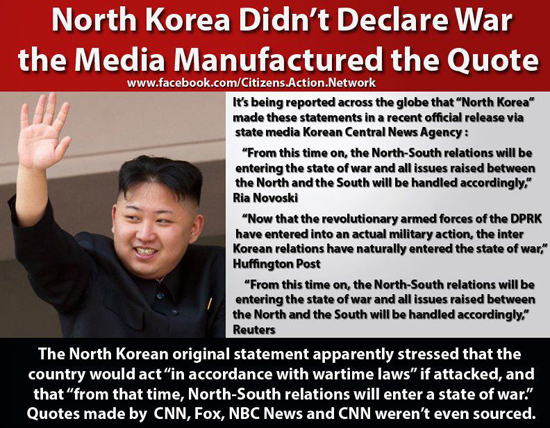 Western media have been peddling a fake line of spun news which is designed to make the USA look peaceful and the DPRK (Democratic People`s Republic of North Korea) look like a crazy nuclear aggressor. In the western media and diplomatic commentaries North Korea’s statements have been played down as “little new” while in fact there is much new to the current situation that heralds grave danger and an increasing chance of nuclear war by the hour. One does not have to be a fan of North Korea nor of the USA to decipher the reality of the current situation and in fact those who are fans of neither parties are in a good position to be realistic. North Korea is governed by a tight system mixing cultural, national and racial superiority with claims to socialist and communist values, in reality creating probably the world’s largest cult around the figure of the Supreme Leader, who is also the world’s youngest Head of State, Kim Il Jong, who was educated in Switzerland. The United States of America is governed by a banker – corporate conglomerate profit-first state-capitalist system with a foreign policy and media under the tight control of a fanatical elite and which is actively preparing for direct war on its citizens as this article reveals. The U.S. regime which represents these elites and has little to do with the American people. In order for it to bring about the direct fascist rule by decree under “emergency laws” for which its various agencies have been beefed up to extreme levels as revealed in the above-mentioned article, it must bring about another “9/11″ type event……………………”. Does Julia realise what is going on? The Yellow Sea has been historically the gateway to Chinas heartland (Beijing and Tianjin) and the military drill area chosen by the US and South Korea is a just about 300 miles from Beijing. As the US adds the 400-mile combat capability of the U.S.S. Washington, its easy to understand Chinas security concerns. Would the US allow a similar military operation to take place off the Atlantic coast, 300 miles from Philadelphia, Boston and New York? Not likely! But patience is a great virtue mastered by both the Chinese masses and the ruling government in Beijing. It has been said by insiders from many quarters that three world wars will be necessary in order to complete the long-laid plan for World Dominion. After WWI, the Versailles treaty – of which the measures against Germany guaranteed a second World War – M. Clemenceau boasted that ‘we are carrying the war on into the peace’. On April 27, 2002 an article in the Arizona Daily Star carried a report with a statement by Ra’anan Gissen, a senior adviser to Ariel Sharon. And the Zionist media owners, who having got their truly evil Balfour Declaration, proceeded to lie America into the War. Israel and its people are single greatest threat to global peace and stability, and always were, and our politicians (on both sides) grovel before these thieves and murderers..